Tapio Laukannen navigated by compatriot Pasi Torma chalked up his second successive Eldoret Rally victory after leading his MRT Racing teammate Manvir Baryan to a 1-2 podium finish. 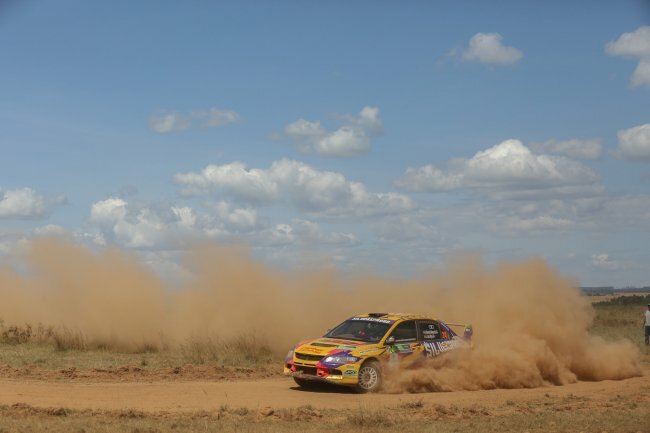 Victory in the Western Kenya Motor Club organised round saw the Flying Finn complete an empathic hat-trick and indeed his fourth scalp of the season. Rajbir Rai who announced his retirement from the sport at the end of the season sealed the podium dash after trailing Baryan by 2 minutes 26 seconds. Baryan took over the lead from Laukannen by scoring his second fastest stage of the day at the end of CS5 and was seven seconds ahead of his teammate who went on to clinch the remaining four stages of the second loop to pull through in awesome fashion. Laukannen won six of the nine stages at stake with Baryan winning two and Chatthe claimng CS2. The technical terrain in Uasin Gishu and Elgeyo Marakwet proved quite unforgiving to some top drivers including Chager and Ian Duncan who went out aftet CS1 and CS6 respectively. Laukannen driving a Subaru R4 car clocked 1:26.19 hours to secure his fourth victory of the season after ruling the season opening Kajiado Rally, Wundanyi tour and Nanyuki in August. After six rallies, Laukannen has extended his lead on the Kenya National Rally Championship log by 25 points over champion Jassi Chatthe who was time barred after second service. Laukannen leads the eight leg series with 129points with Chatthe a distant second on 100. In an interview, Laukannen savoured his second straight win in Eldoret but conceded that it was a tormenting experience prior to victory. "It was a hard day for us today. We got two punctures 10 kilometers before the end of the third stage and lost quite a bit of time there. On the same stage we broke the rear axle and it was even boring coming back to service. We managed to rebuild the car on the second loop and took it a lot more carefully and it was paying off nicely as the rally wore on," said Laukannen. Baryan was all smiles after racking up his best career best podium result. "This is the best ever result we have had since joining the sport three years ago. It never came as a surprise though, we were pushing really hard in the morning run and were lucky that some of the top contenders picked up punctures," said Baryan. Chatthe was left to rue the CS4 woes which cost him a podium finish after a great run in the morning. "It was a good day in the morning. I mean we started really well but towards the end of the fourth stage we damage our front left arm which caused a puncture. We had to stop to change the puncture in the stage and by the time we came back in service we replaced the arm, got back to the end of the rally only to be told that we were time barred," said Chatthe. Rajbir savoured a podium finish for the second year running and this is what he had to say after last service at Chemweno farm: "It was a good day for us. We were first on the road so we were a bit cautious," Rajbir said. 1. Tapio Laukannen (Subaru R4) 1hr 26m19s, 2. Manvir Bryan (Ford Fiesta R4) 1:27.11, 3. Rajbir Rai (Ford Fiesta) 1:29.37, 4. Carl Tundo (Ford Fiesta Proto) 1:31.34, 5. Tejveer Rai (Evolution X) 1:33.57, 6. Amaanraj Rai (Evolution X) 1:34.15, 7. Piero Cannobio (Evolution 10) 1:35.16, 8. Jasmeet Chana (Evolution X) 1:35.58, 9. Mahesh Halai (Subaru N12) 1.38:28, 10. Asad Khan Kalulu (Subaru) 1:38.58.